In the east, Karl-Marx-Allee. A 2km long triumphal route of overbearing, neo-classical blocks that’s more Moscow than Mitte. On first sight, it has all the architectural subtlety of a wedding cake, with neoclassical features thrown uncomprehendingly onto the giant facades of soviet prefab-system blocks. Many of the buildings of Karl-Marx-Allee (previously Stalinalle, and originally Frankfurter Allee) seem hard to love. At Frankfurter Tor, the apogee of the street’s design, two huge towers top the nine storey blocks, forming a formidable eastern gateway to the city. Apparently inspired by Schinkel, they look awkward and oddly proportioned, like something stuck on top of a UK supermarket to obtain planning permission. And meanwhile, over in the west, the Hansaviertel. A mix of blocks of flats and individual houses, designed by a virtual who’s-who of modernist architecture for the 1957 Interbau – an international housing exhibition. It includes designs by Arne Jacobsen, Walter Gropius, Max Taut, Alvar Aalto, Oscar Niemeyer. It would have even had a version of Le Corbusier’s Unité d’habitation block (the first of which is in Marseilles), but this was located in nearby Charlottenburg as it was too large to fit on the Hansa site. In the Hansaviertel (Hansa quarter, in translation), understatement rules, with clusters of assymetrical modernist buildings interspersed with green spaces. It’s a lovely location – the estate rises up out of the trees of the Tiergarten’s northern edge, with individual modernist houses giving way to taller blocks of flats, each set amongst trees and landscaping. There are no grand ceremonial routes here. The Hansa ticks all the right design boxes; an impeccably dressed party guest, disdainfully eyeing the Allee’s vulgar Ossi gatecrasher. So why is it Karl-Marx-Allee that I’m drawn to? Why that sense of fading grandeur as I cycle toward Alexanderplatz on a cold January night, the chandeliers of the Kino International twinkling through the freezing air? It’s some of the later, individual buildings that really appeal to me; Cafe Moskau, the Kino International, and the Kosmos. A real sense of GDR glamour survives in them – they retain most of their original features, and the quality of the architecture prevents them becoming just kitsch. Surprisingly (to me at least) these buildings form part of the later (1960s) stage of the Allee‘s construction. My initial impression was that it was a microcosm of Soviet architectural history, with early modernist intentions giving way later to overscaled neoclassical monstrosity. Actually, the Allee‘s history is complex, and its architecture often wrongly attributed. The International and the Kosmos were both designed by Josef Kaiser and Herbert Aust, and I assume that they also did Cafe Moskau on the other side of the street. A good place to start exploring is Henselmann’s prototype for the rest of the Allee, Hochhaus an der Weberwiese. Round the corner, back on the Allee, is Café Sibylle, a fabulous GDR cafe which also has a permanent exhibition about the Allee’s history. There’s a good article in the International Herald Tribune, celebrating last year’s 50th anniversary of the Hansaviertel, describing how the area is once again becoming a hip place to be. Apartments there are sought after by a new generation of architects, designers and media folk, the angle being that this is no museum piece. Fair enough. But for me there’s something slightly self-satidfied about the Hansaviertel, confident in its coolly understated design (there’s nothing understated about the twin towers at Frankfurter Tor). Hansaplatz, containing a theatre, small shopping centre and U-bahn station, has become quite run-down, and I’m guessing is yet to catch up with the ‘rebirth’ of the area. It does however include a small visitor centre with a lot of information on the Interbau and related topics. The block by Niemeyer is his only German building (besieged, the day I saw it, by a group of Brazilian architecture students who took turns photographing each other sitting in the crux of its huge V-shaped support columns). For me the most successful of the towers is the one by Hans Schwippert, although oddly there’s no entrance vestibule at all – the separate entrance doors lead directly to the stairs and to the ground floor flats. For an Expo building, I had expected something grander: glass, steel and a couple of Mies Barcelona chairs \perhaps. The nearby Akademie der Künste, designed by Werner Düttmann, was built later than the Interbau, and the site was originally intended for other housing (but not, I think, for the Le Corb block). Being the kind of person I am, I loved the detailing – to the right of the entrance, rainwater is directed off the building at roof level then falls freely to onto an enclosed square of uneven stones concealing the drain. Some more images here at Flickr. Maybe my views are tainted because the architectural style (if not the quality of ideas) of the Hansaviertel became the default style of the western world for the next fifty years. Location is a factor too; Karl-Marx-Allee runs right through Friedrichshain, one of the livelier parts of the city, especially at night. As soon as you turn off into the side streets, away from the imposing Stalinist blocks, the true east Berlin urban fabric of late 19th century streets reasserts itself, with hundreds of cafes, bars etc. Perhaps this is all being a little unfair; no-one who chooses to live in the Hansaviertel is looking for the edginess and nightlife that you find in the city’s east. But it’s also ironic that Karl-Marx-Allee was the grand statement of formal, centralised planning, but now lies at the centre of Berlin’s more ‘chaotic’ side; its nightlife and culture. The Hansaviertel, a demonstration of the west’s less dictatorial planning and its liberal values, feels much more the museum piece. Here’s the complete list of architects who designed buildings in the Hansaviertel, although if you’re wandering about, the information is clearly set out on some location signs, and you can get a guide leaflet at the office for a couple of euros. Alois Giefer + Hermann Mäckler, Frankfurt/M. Johann Heinrich StrackThe Interbau also included the Hugh Stubbins’, Haus Der Kulturen Der Welt to the east of the Hansaviertel, and the Corbusierhaus in Charlottenburg. 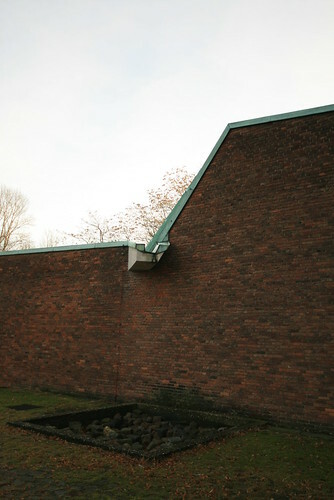 The earliest buildings, built 1949-50, are by Ludmilla Herzenstein, an associate of Scharoun. The largest blocks, which include both pairs of towers, built 1951-52, are by architectural chameleon Hermann Henselman. And I use the term ‘chameleon’ advisedly; I was amazed to discover that the Karl-Marx-Allee blocks were by the same architect as the Haus des Lehrers and Berlin Congress Centre, just along the road at Alexanderplatz. See also my own post on Alexanderplatz, which includes the Hause Des Lehrers / Kongresshalle, here. 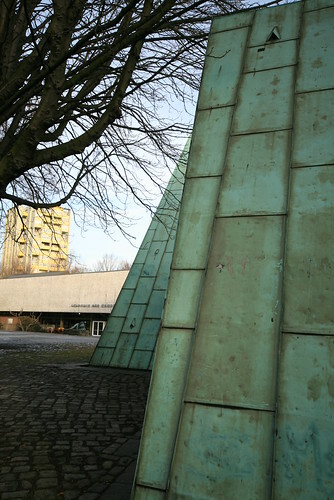 The remaining blocks are by various architectural ‘collectives’, individually headed by Egon Hartmann, Hanns Hopp, Kurt W. Leucht, Richard Paulick and Karl Souradny. As previously noted, the Kino International, and the Kosmos (now a multi-screen) are by Josef Kaiser and Herbert Aust. I know a girl who lives in the Schwippert building. I had the pleasure of redesigning her maisonette. The original 50s design had tiny kitchen, functional bathroom; we don’t live like that now. She likes cooking so she can stand at her 7th floor window ,cooking, and look out over the Tiergarten. Wow! At the recent Moabiter Inselglück weekend I was able to visit a couple of artists homes high up in the building just south of Str 17. Juni. Very adaptable modernist plans, one flat was original (but painted white, thank God) the other had been gutted and refitted with sliding panels where the walls used to be. Both with large balconies and great views and sun to the towers of Potsdamer Platz. As to K-M-Allee: you need to research the East-West postwar urban planning split to get the full picture. They all started out “in one boat” but as the city gradually separated, amoeba-like, so too East German and East Berliner political entities crystallised out and an ideological split developed. In the last years of the war, Scharoun and Henselmann and their respective sattelites were developing Hansaviertel-like concepts for the Greater Berlin area. There is a book called “Unser die Strasse, unser der Sieg” about building K-M-A (well ACTUALLY about building Stalinallee) and the gloy of communism. Haven’t managed to read it to the end . . . wonder where I put it? PS: in one of your articles you state that you find Berlin underpopulated, we’re all just squatting in a town too big for us. True. Berlin had about a million more people pre-War. http://en.wikipedia.org/wiki/File:Berlin_Einwohnerentwicklung_1880_2006.jpg. I’m trying to reference this what the hell are you called?